A pizza boy is wandering the crowded streets of LEGO® City, and it's your job to find him! 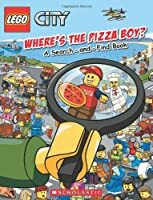 This Search-and-Find book is filled with amazing detailed scenes starring all of your favorite LEGO City characters. Once you've found the pizza boy, there are tons of other cool things to look for. It is hours of LEGO fun! !